Popular smart phone game finally enters the snuggle realm. Halfbrick, clearly annoyed by all the Angry Birds merchandise clogging shelves, decided to one up the competition with a line of admittedly adorable Fruit Ninja plush toys, currently available at the Fruit Ninja store. Yes, that's a thing. 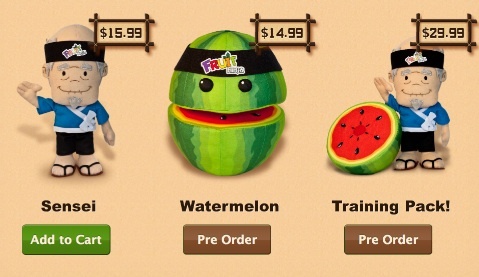 The partnership, forged with ToyFoundry, resulted in cute and cuddly versions of the all-knowing sensei, a watermelon and training pack, which contains both. We call dibs on the melon. "With Fruit Ninja's universal success, this partnership just developed naturally," said Phil Larsen, chief marketing officer at Halfbrick. "Our fans are crazy about Fruit Ninja and this is a really fun and charming way to extend the brand outside of games." At the moment, only the sensei is available, but you can pre-order the other two.